Shipping and port giant China Cosco Holdings Co. Ltd. (01919.HK) said it will order 11 container megaships, joining several competitors in their quest to dominate the world’s busiest trade routes, The Wall Street Journal reported. The so-called Triple-E’s, which are roughly as long as the Empire State Building is tall, will cost a combined US$1.5 billion and will each carry 19,000 containers from China to northern European port hubs such as Rotterdam in the Netherlands and Hamburg in Germany. Cosco said late Wednesday the order would go to four Chinese yards, which it didn’t name. Container shipping, which moves 95 percent of manufactured goods, has been in the doldrums over the past decade. Overcapacity estimated at 30 percent in the water has sent freight rates to levels that at times don’t even cover the vessels’ fuel cost. 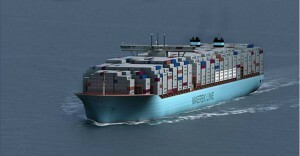 Fully loaded, Triple-E ships cut the cost of moving a container across the oceans by about 25 percent, the report said. Cosco, the listed unit of state shipping company China Ocean Shipping (Group) Co., will benefit from substantial subsidies under Beijing’s scrap-and-build policy, which encourages Chinese operators to renew their fleets.